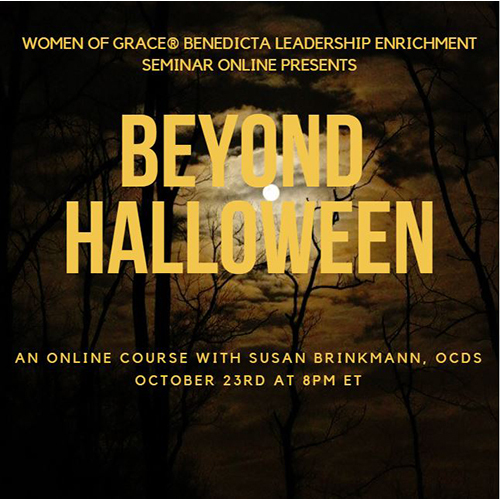 Beyond Halloween: How the Occult is Infiltrating Your Child’s Life, which will take place on Tuesday evening, October 23, at 8:00 PM EST, explains how and why our children’s lives are being targeted by the occult. In this age of relativism, when objective truths are no longer considered to be absolute, truth-based beliefs about the devil and his antics are considered to be old-fashioned fairy tales not worthy of consideration. Instead, they are being replaced by the idea that a little bit of evil isn’t always a bad thing and can do wonders when it comes to keeping children occupied. The perfect example are children’s fantasy books where the same magic wielded by evil characters is used by the “good guys” for altruistic purposes such as to save the world or prevent some greater evil. What this does to the mind of a child is turn the moral order on its head and make the use of sorcery and other diabolical means into a kind of “tool” that has no moral implication at all. These twisted plot lines explain why sorcery and witchcraft have become so popular with teenage girls and why books on these subjects are consistent bestsellers. Occult infiltration into children’s games has also come a long way since the Ouija board, which remains a perennial favorite despite the fact that it relies on the conjuring of spirits. Occult RPG’s (role playing games) are all the rage these days with some games going so far as to require the player to sell his/her soul to the devil in order to play. Others require children to role-play as sorcerers who use magic to destroy their opponents. If games and books don’t get them interested in the dark arts, there’s always television and movies. The highly popular Long Island Medium airs on TLC during prime time and makes contacting the dead look like charity work. Netflix and Hulu are loaded with occult-based pagan, Wiccan and New Age movies ranging from The Good Witch to The Secret Circle and The Last Keepers. In addition, shows about ghostly hauntings make these manifestations look like just another day in the life of your friendly neighborhood paranormal investigator rather than what they really are – potentially dangerous demonic infestations. Many pass off interest in these types of entertainment as just an innocent childhood fascination, but recruiters for Satanism are the first to refute these denials. When children are permitted to develop a taste for the occult, it makes their job much easier which is why their main targets for recruitment are children, particularly those of middle-school age. So what does a parent do to keep their child safe? The most important thing they can do is educate themselves about what the occult is, why it’s dangerous, and how it hides itself in children’s entertainment. Knowledge is power, and when coupled with serious prayer, much can be done to ward off the darkness that is threatening our children. This webinar is aimed at giving parents the information they need to discern threats to their child’s spiritual welfare while providing the appropriate steps to take that will insure the safety of their family.